In the middle of the 20th century, some of America's most storied grantmakers, including the Ford Foundation, the Rockefeller Brothers, and the New World Foundation, placed the heft of their wealth and influence behind the country's growing civil rights movement – and in doing so earned the wrath of their government. This was because the foundations backed the movement extensively, including providing funding for voter registration drives in the segregated South as well as supporting a range of civil rights groups. This did not go down well with the nation's pro-segregation politicianswho opposed them fiercely – some like the Republican Wright Patman even lobbied for the government to take over the foundations' charitable work. Today, they actively collaborate with governments where needed, and are among the heaviest financial contributors in the development sector. For example, of the 28 global foundations interviewed for this whitepaper, 21 of them collectively gave USD 18 billionin 2014-15, a number roughly equivalent to the GDP of Iceland. 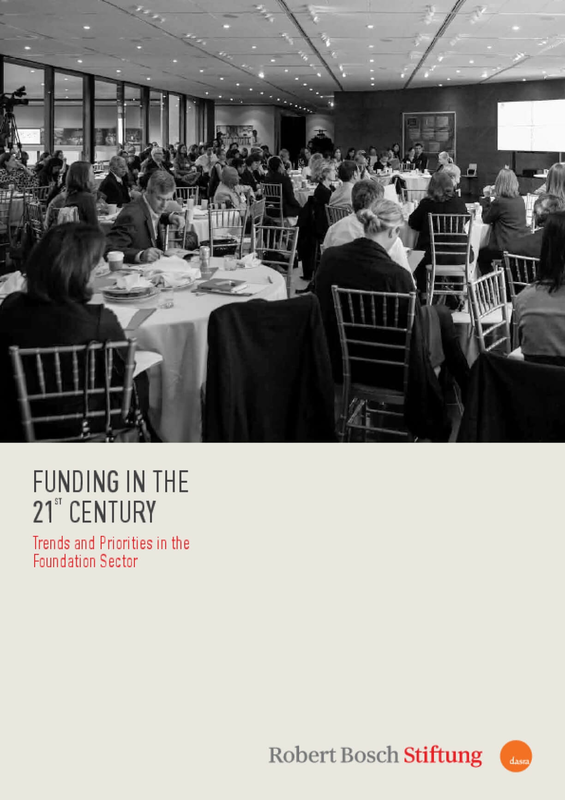 To spotlight both the growing influence and the impressive span of accomplishments of foundations in this whitepaper, Dasra conducted interviews with over 30 sector experts, including heads of global philanthropic foundations, and building on these interviews, hosted a roundtable in Mumbai in March 2016, in partnership with the Robert Bosch Stiftung. The roundtable brought together 25 of the most influential foundations worldwide, with the aim of building consensus on the role that their organizations can play in contributing to and fueling the global development agenda and to explore avenues for collaboration. You've heard the proverb: "If you want to go fast, go alone. If you want to go far, go together." For 40 years, The New York Community Trust has been figuring out how to effectively "go together." The Trust has been funding collaborative funds for the last 40 years. 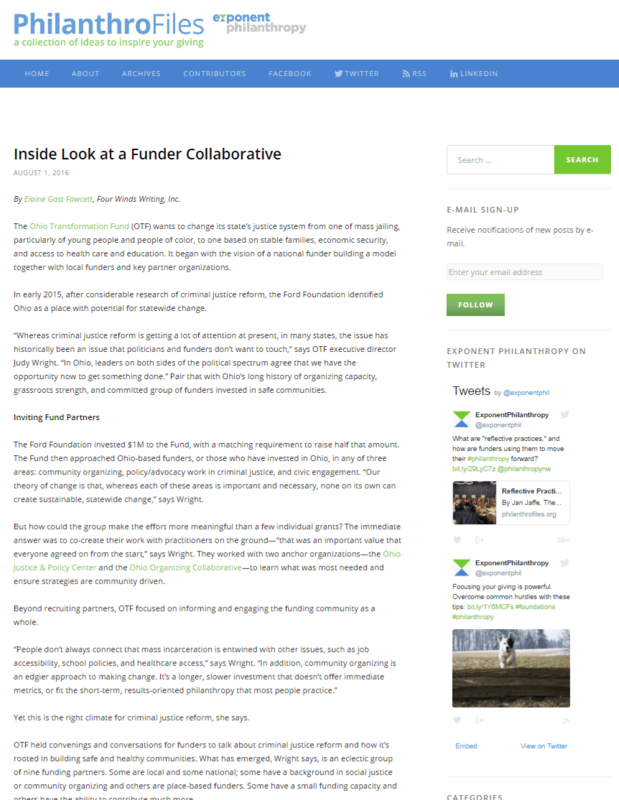 By joining forces, funders combine the resources of many to tackle larger agenda, tougher issues, or long-term challenges. The Trust's most substantial collaboration to date was the September 11th Fund, which pooled $534 million from two million individuals from all 50 states, and 150 countries. The Trust has been home to 20 other collaborative funds, distributing more than $119 million. "Donor collaboration is on the rise because it meets many needs. By joining forces, funders leverage the resources of many to tackle larger agendas, tougher issues or long-term challenges," says Lorie Slutsky, president of The New York Community Trust. 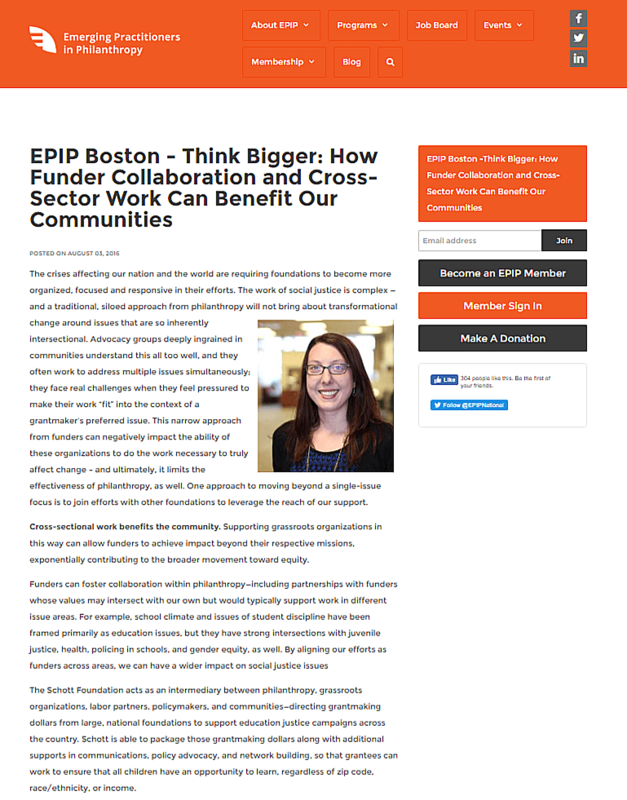 "Collaboration also provides philanthropists with an opportunity to get involved in areas in which they are not experts or take risks they might not assume on their own." 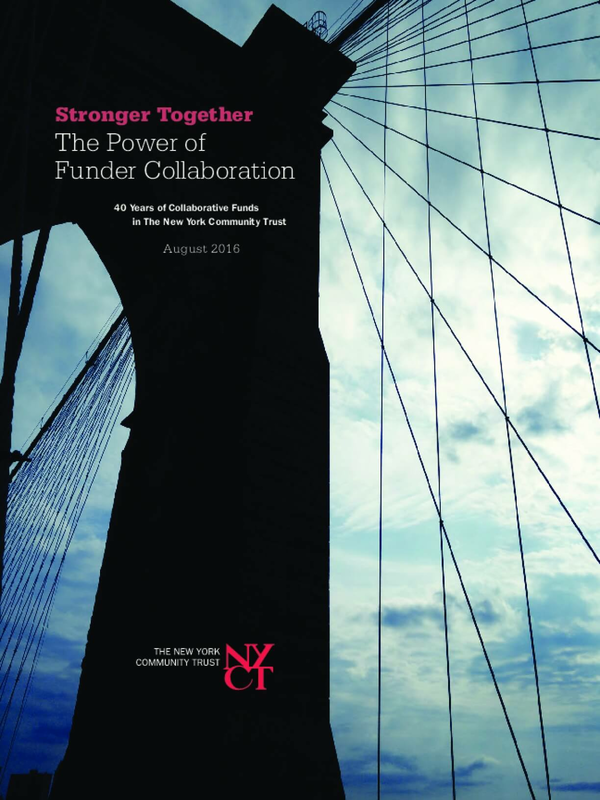 To showcase the incredible work of its funder collaboratives, The Trust has launched the report "Stronger Together: The Power of Funder Collaboration." We discuss the innovative strategies of collaboration, and the lessons we've learned about working together to solve complex problems. When funders pool resources, anything is possible. 140 foundations and other collaborators made the City's public school system better for all students; led the fight against AIDS in New York City; and created affordable housing while strengthening organizations that support it. As part of the Atlas Learning Project, an effort of The Atlantic Philanthropies, this paper examines the role of legal advocacy as a tool in the social sector for advancing issues of justice and equality. The primary audience for this paper is funders who are interested in enhancing their advocacy or other program work by supporting legal advocacy. 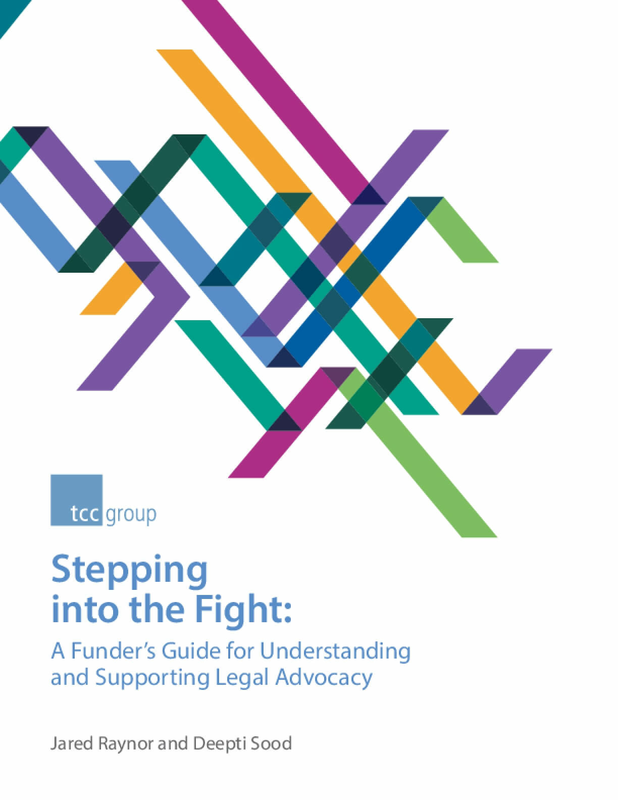 The paper will serve partly as orientation to legal advocacy from a funder's perspective and partly as a guide to effective approaches and practices for supporting legal advocacy. The Atlas Learning Project is a three-year effort supported by The Atlantic Philanthropies to synthesize and strategically communicate lessons from the advocacy and policy change efforts that Atlantic and other funders have supported in the U.S. 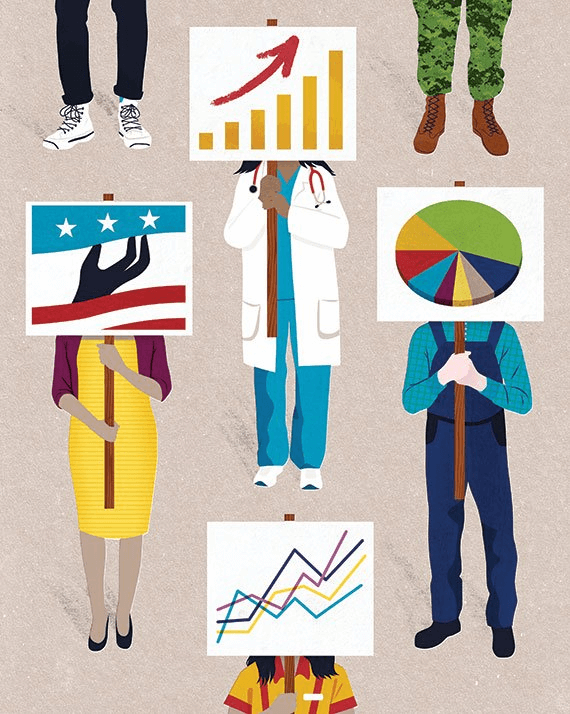 The effort was led by the Center for Evaluation Innovation, which commissioned various researchers to probe into questions about advocacy work and how funders support these efforts. 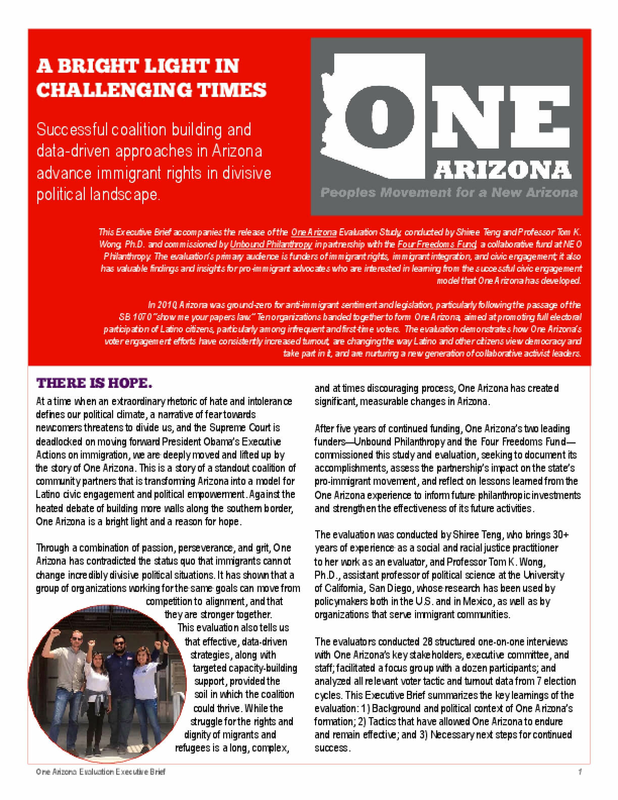 At a time when an extraordinary rhetoric of hate and intolerance defines our political climate, a narrative of fear towards newcomers threatens to divide us, and the Supreme Court is deadlocked on moving forward President Obama's Executive Actions on immigration, we are deeply moved and lifted up by the story of One Arizona. This is a story of a standout coalition of community partners that is transforming Arizona into a model for Latino civic engagement and political empowerment. Against the heated debate of building more walls along the southern border, One Arizona is a bright light and a reason for hope. In 2010, Arizona was ground zero for anti-immigrant sentiment and legislation, drawing national and even international headlines for SB 1070, the "show me your papers" law. 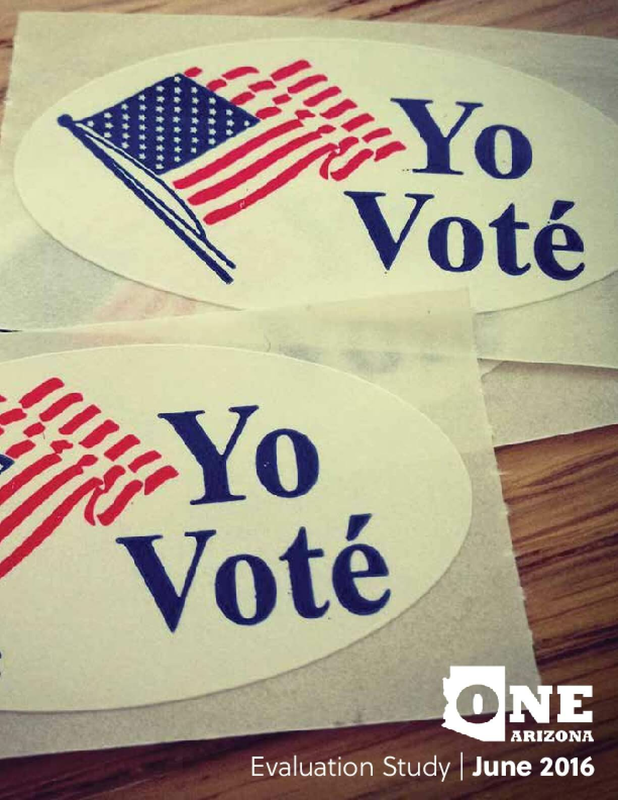 Activists responded to form the nonpartisan One Arizona, aimed at promoting full electoral participation of Latino citizens, especially infrequent and first-time voters. Three years later, the coalition expanded to target young citizens and unmarried women while continuing to focus on voter registration, voter mobilization, and election protection. 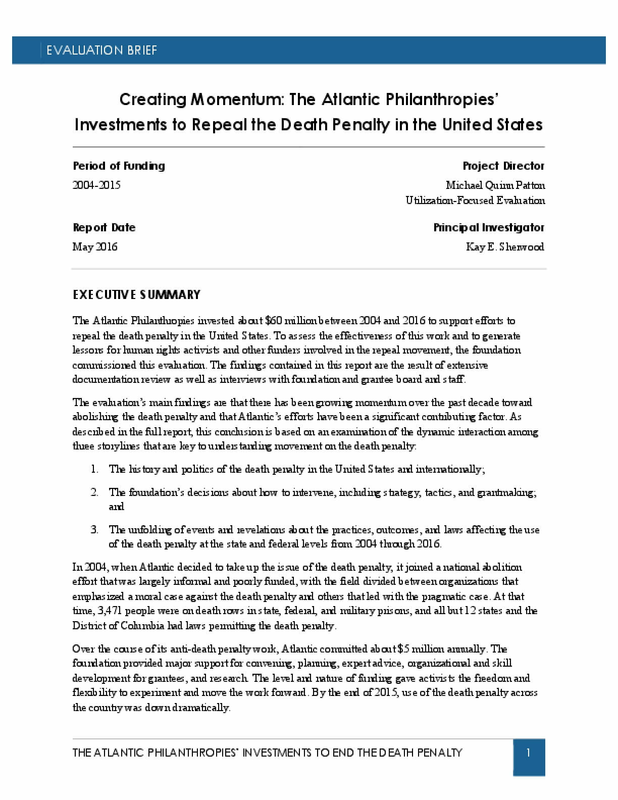 The Atlantic Philanthropies invested about $60 million between 2004 and 2016 to support efforts to repeal the death penalty in the United States. To assess the effectiveness of this work and to generate lessons for human rights activists and other funders involved in the repeal movement, the foundation commissioned this evaluation. 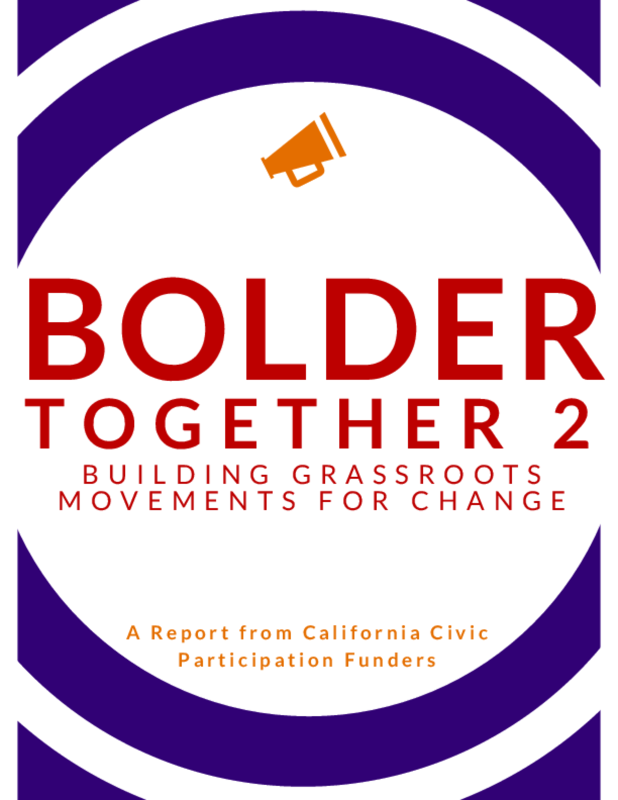 The findings contained in this report are the result of extensive documentation review as well as interviews with foundation and grantee board and staff.